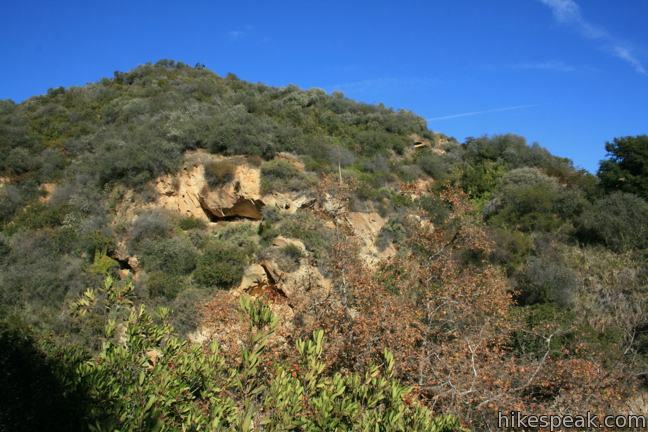 Next to Will Rogers State Historic Park is a shady canyon with a shady past. 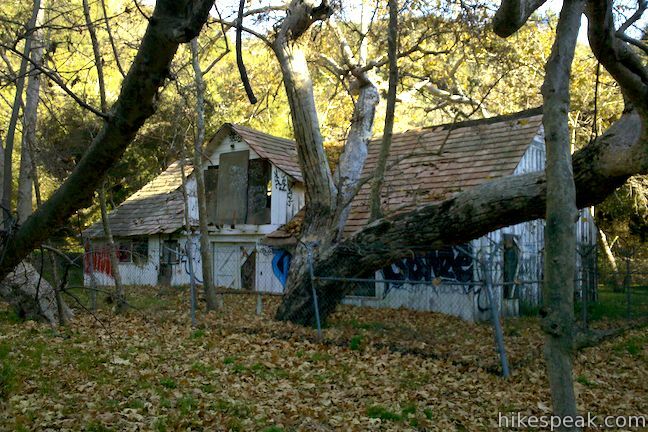 The ruins of Murphy Ranch, a compound built by Nazi sympathizers in the 1930s have been left behind to decay in Rustic Canyon. 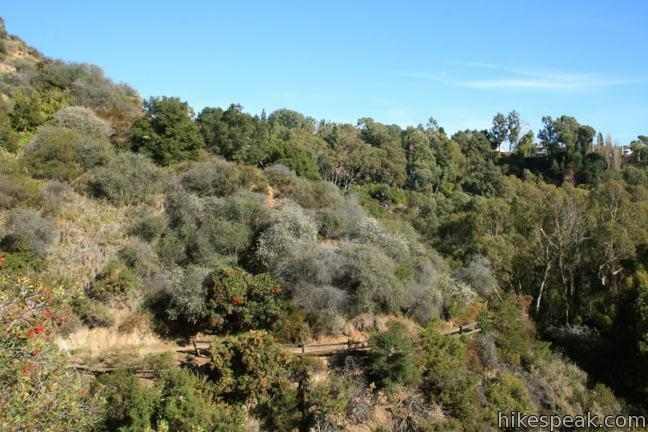 For adventuresome hikers, a trail enters Rustic Canyon from the east side of Will Rogers SHP. Beyond the end of the trail is a long unmaintained path up an overgrown canyon to the ruins. 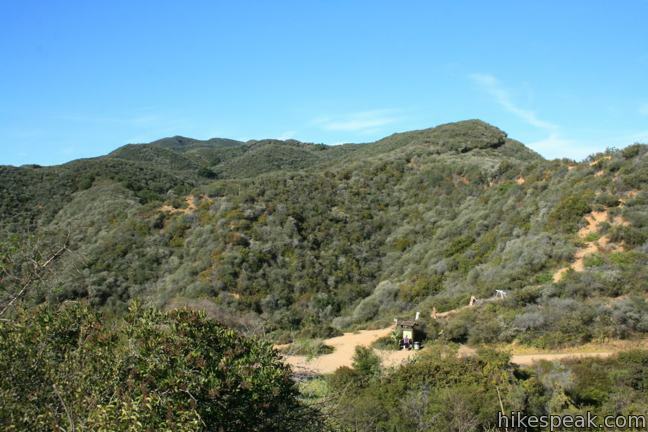 Murphy Ranch can be visited as a 4-mile out and back hike with 225 feet of elevation gain, or as a 5-mile loop with 950 feet of elevation gain that circles back to Will Rogers State Historic Park on the Backbone Trail. 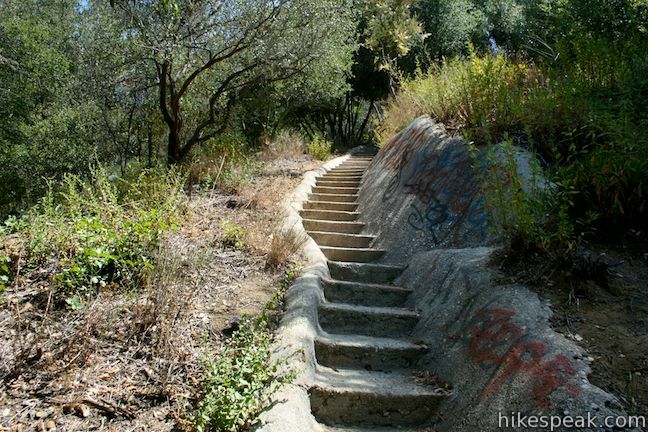 An alternate route, and the easiest way to the ruins, is to hike to Murphy Ranch from Sullivan Ridge Fire Road on the east side of Rustic Canyon. Nazi sympathizers Herr Schmidt, Winona and Norman Stephens, and their followers built this self-contained stronghold in the Pacific Palisades in the 1930s. They planted gardens up the walls of the canyon and constructed several facilities like a power building with a massive diesel generator capable of providing all their electricity. 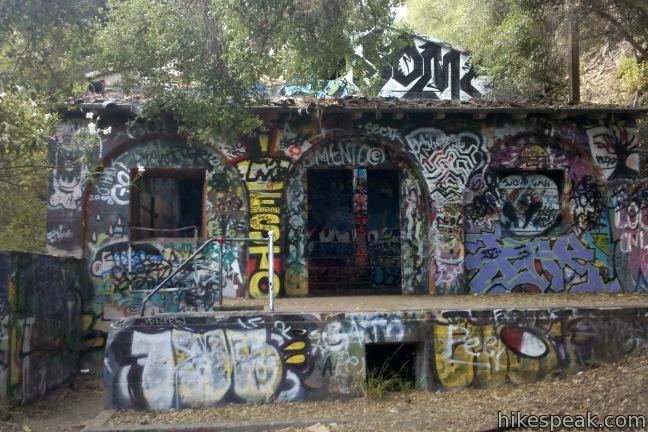 Murphy Ranch was designed to serve as a holdout for fans of the Third Reich waiting for America to fall to the Nazis. Instead, the ranch was raided by U.S. authorities and closed in 1941. 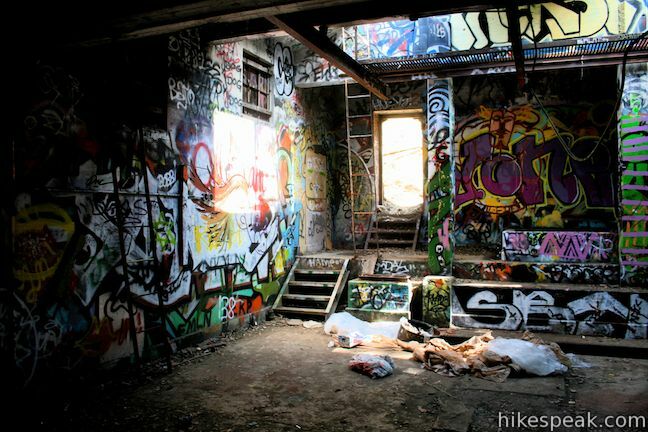 The abandoned buildings were transformed into an artists’ colony in the 60s and 70s, before being abandoned after the Mandeville Canyon Fire in 1978. 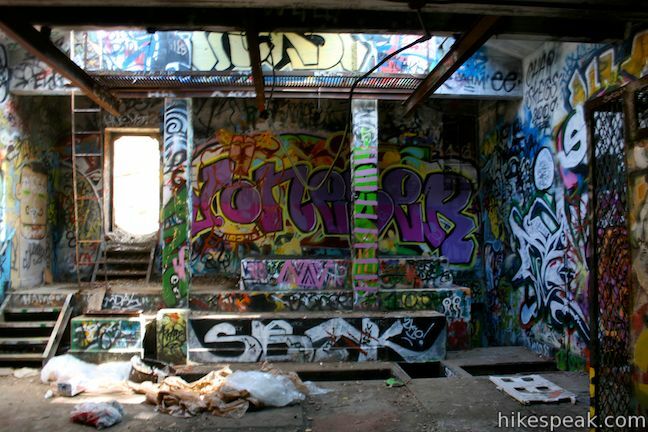 Today the grounds of Murphy Ranch are uninhabited, dilapidated, and covered in graffiti. Before its demise, Murphy Ranch was said to attract dozens of local Nazi sympathizers who performed military drills during weekend gatherings. Winona and Norman Stephens invested $4 million in Murphy Ranch. They had become convinced that when Europe inevitably fell to Germany, America would be reduced to anarchy, and the National Socialist Party would need a self-sustaining stronghold in the mountains outside Los Angeles to survive the fall and plot the American takeover. History proved to be a bit different. Authorities monitoring the ranch raided the facility shortly after the bombs fell on Pearl Harbor, arresting Schmidt and others for espionage. A radio capable of communicating with Germany may have been confiscated as well, but many of the specifics of this blight on Los Angeles history have been lost to time. The Stephens had commissioned famed African-American architect Paul Williams (who designed the homestead now in ruins in Solstice Canyon) to build a four-story mansion within the canyon, but those plans were never executed. 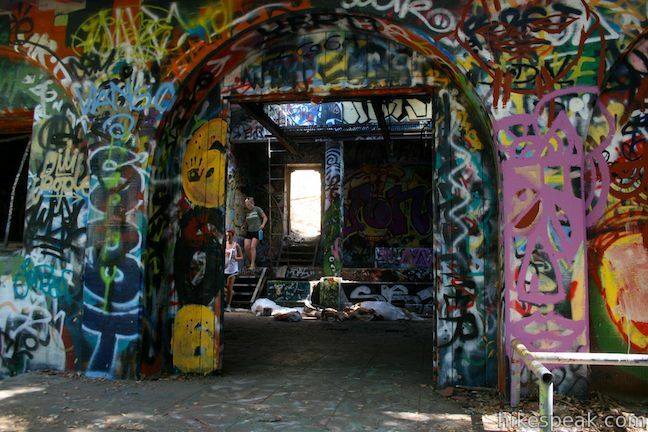 Elements of the bizarre retreat that were built have been left to decay by the Los Angeles Department of Parks and Recreation, and are open to the public to explore. 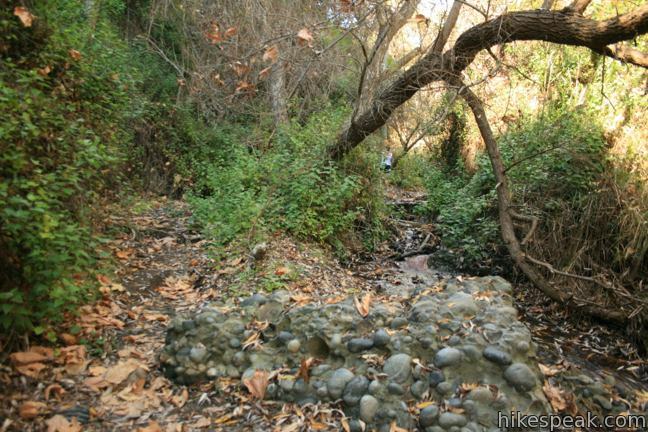 According to rangers at Will Rogers State Historic Park, the trail through Rustic Canyon is unmaintained “because it’s unmaintainable.” Indeed this is not your usual canyon trail with muddy stretches, steep stretches, and hard to follow stretches. The path crisscrosses a creek up a canyon that is very narrow in places. The flow of the creek fluctuates and can deliver its fair share of wet feet. By starting at the bottom of the canyon and hiking up, you reduce the chance of becoming overwhelmed by the water level or getting lost in the canyon. Be prepared for a slow-going adventure and remember that your safety is your responsibility. 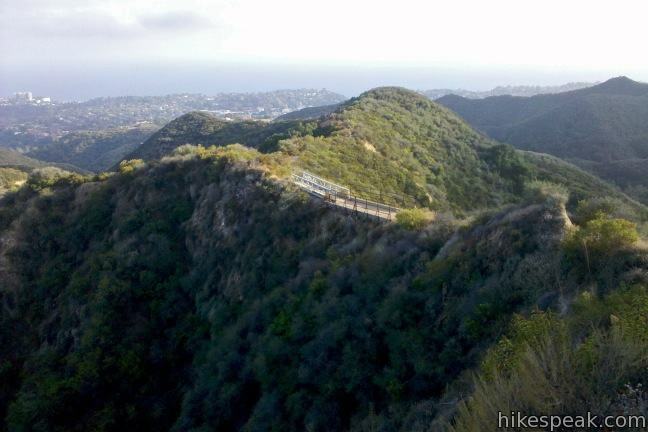 Find Rustic Canyon Trail entering Topanga State Park from the east side of the Will Rogers Polo Field. Hike a third of a mile down a maintained dirt single track dropping into the canyon. When you hit the creek turn left and head up the canyon. The nice trail disappears, leaving you to pick your way up the canyon. A footpath flip-flops across the creek up the narrow canyon through a jungle of vegetation. This is a wild canyon without much of a conduit for hikers. After half a mile you will reach a check dam built across the creek where an artificial waterfall flows. Take the steep track up the dirt slope to the right and continue upstream. 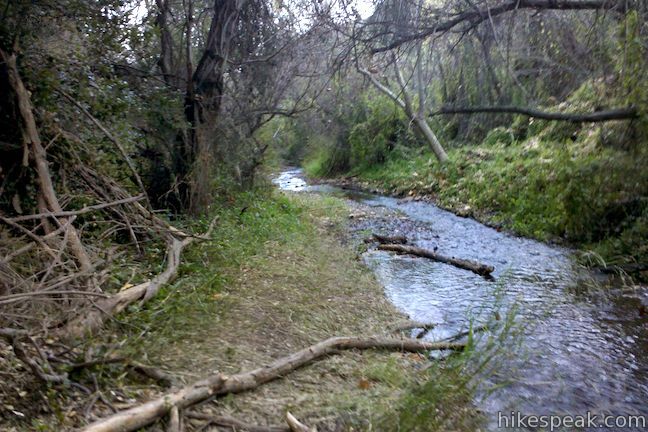 It is another mile of bush washing and creek crossing to reach the ruins of Murphy Ranch. When you get close the main ruins, the trail crosses a wooden stable being overgrown by the forest. Stay on the right side of the creek and continue up a faint single track that breaks out of the trees onto a dirt road. Eureka! Turn left and walk less than a quarter mile to the crumbling ruins of Murphy Ranch, cloaked by live oaks and sycamores. The first building you reach is covered in spray paint and once held the diesel generator and fuel tank that powered the ranch. Step inside the large concrete power building, which has been hollowed of its machinery for a haunting experience. Around the power building are raised gardens and other foundations. The ruins include long cement staircases that climb all the way up the east side of the canyon to Sullivan Ridge Fire Road. These steps offer another way to visit the ruins, a 3.85-mile hike with 325 feet of elevation gain that does not require you to traipse through an arduous unmaintained canyon. A few hundred feet north of the power building, the road passes a collapsed structure that served as the troop’s machine shed and garage. 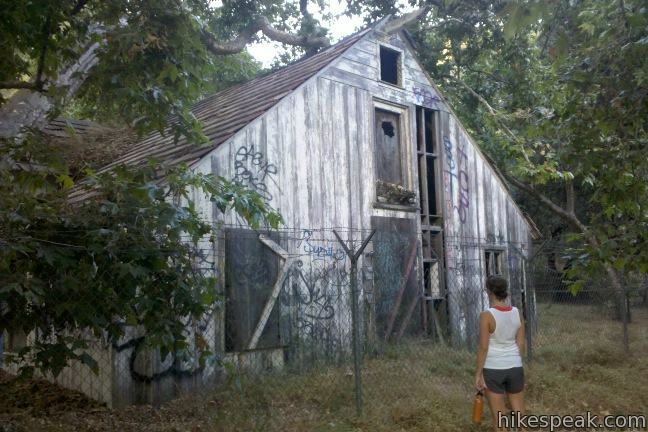 This is the last major building from the ranch, and the turnaround point for the out and back hike up Rustic Canyon. To continue the loop, find a path heading farther up the canyon on the right side of the creek above the machine shed. The trail leads you past a large white spooky barn to a junction on the left, a third of a mile above the ruins. Straight ahead the trail continues toward Camp Josepho, a boy scout camp that is closed to hikers. Turn left, following the sign for the Backbone Trail. Cross the creek and begin up an ivy-covered forest on the west side of the canyon. 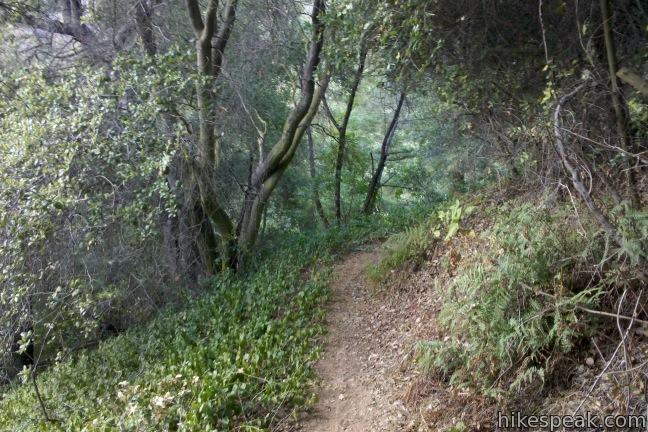 The trail climbs a slope of chaparral, tackling 625 feet of elevation in 3/4 of a mile. The trail is steep and rutted toward the top. 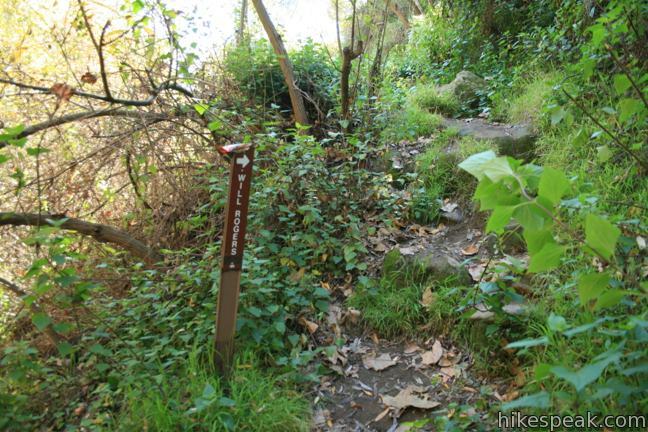 If the path through the bottom of Rustic Canyon was not so difficult to follow heading downhill, it would be advisable to hike the loop in reverse in order to go down this steep section instead of up. 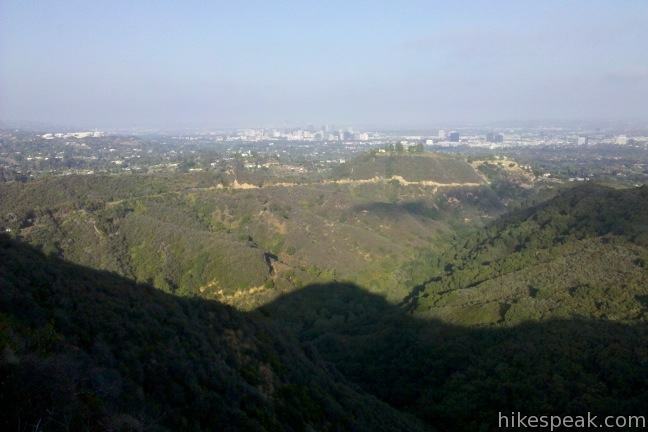 Pause to admire the view over Rustic Canyon as you soldier to the top. Turn left on the Backbone Trail and hike a short distance south to a panoramic summit to reap the rewards of your effort. 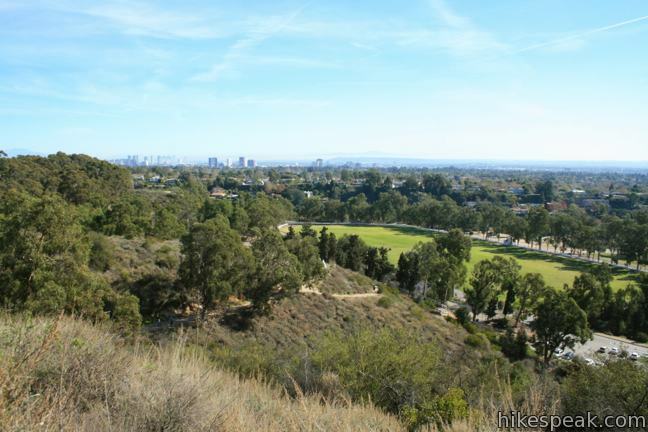 The view looks southwest toward Santa Monica Bay and east across the city toward downtown Los Angeles. 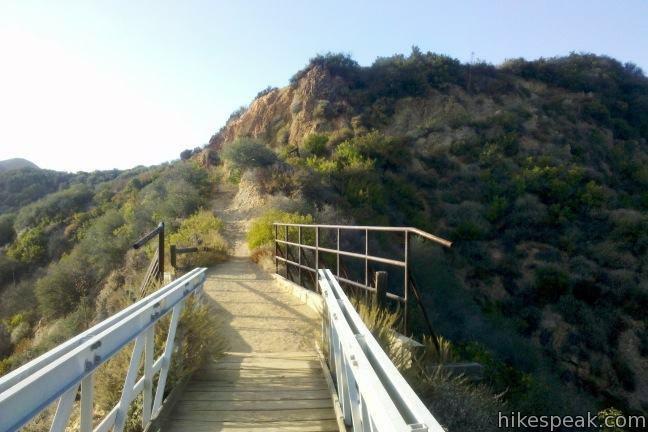 Continue down the Backbone Trail, crossing a white wooden bridge that straddles a saddle just below the summit. 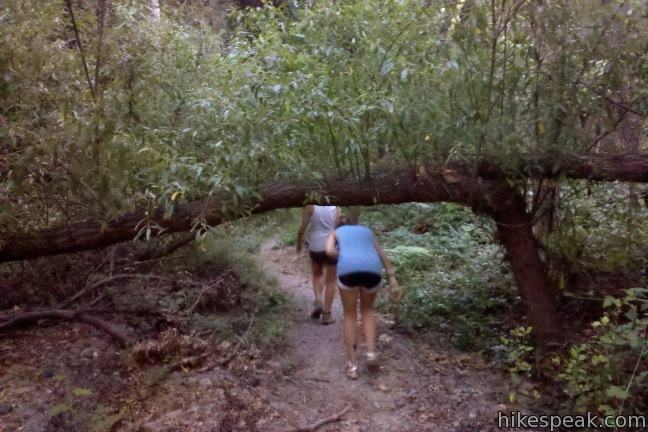 Hike another 0.9 miles down the Backbone Trail to reenter Will Rogers State Historic Park at a junction with Inspiration Point Loop Trail. Continue straight (don’t turn left at the junction next to the large park map) to come to a split with the spur trail to Inspiration Point. If you haven’t been inspired yet, turn left and hike another tenth of a mile up to this easy overlook. 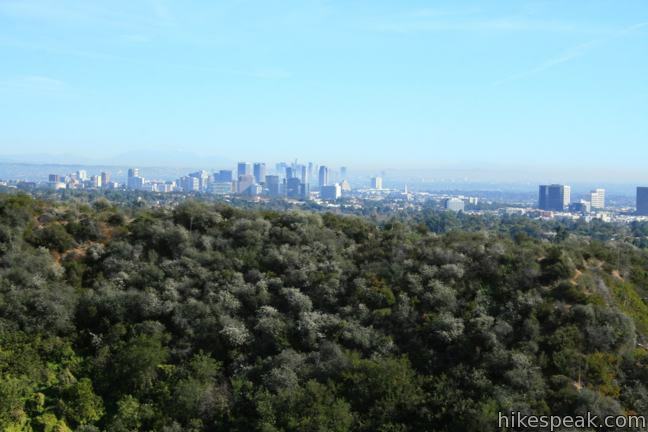 A grand cityscape is to the southeast in front of downtown Los Angeles. 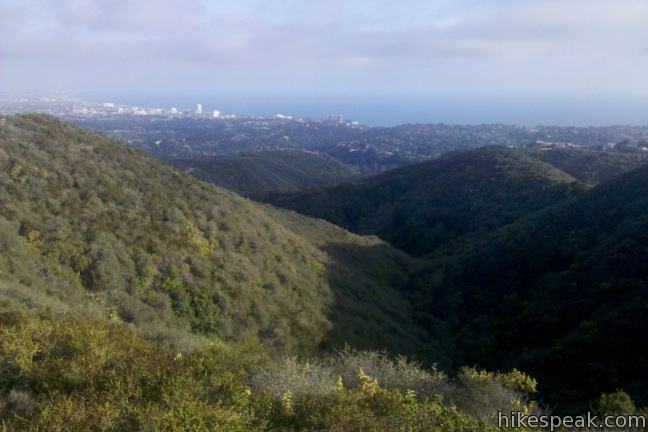 To the southwest, the ocean curls around Santa Monica Bay, and to the north, the Santa Monica Mountains are capped by the 2,126-foot Temescal Peak. Return to the junction and continue hiking southwest. After a third of a mile, you will come to a junction with a single track on the left. This shortcut heads south and reconnects with the trail below, trimming about 0.2 miles off the distance. Inspiration Point Loop Trail continues to the southwest for a bigger view of the Pacific. The trail bends left and descends east toward the polo fields and the ranch. Follow this trail all the way down to a large lawn east of Will Rogers House. Turn right down the grass to return to the parking area where you started. The lawn is an excellent place to have a picnic or play a game of catch if you still have energy. Dogs and bikes are not permitted on this hike. 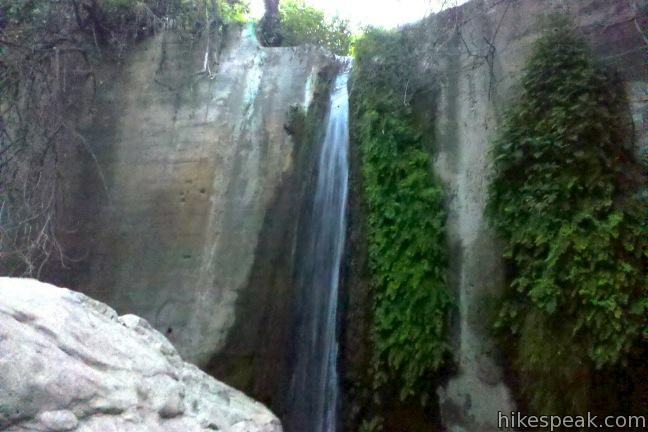 The entrance fee for Will Rogers State Historic Park is $12 (as of 2017), but no permit is required to hike to Rustic Canyon, so get out and enjoy. Update: LA’s Department of Recreation and Parks demolished some of the ruins of Murphy Ranch in the spring of 2016. 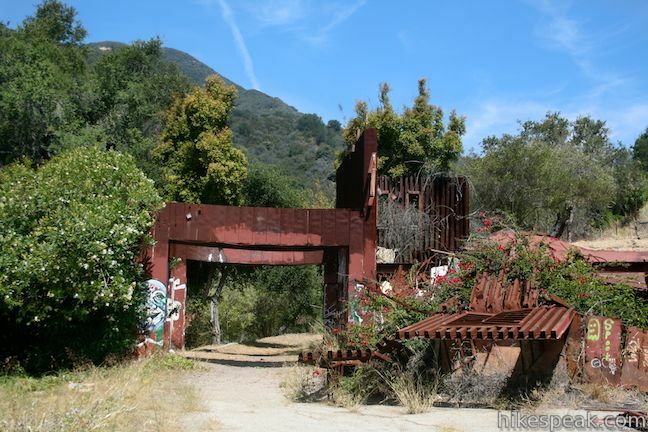 To visit other area ruins around LA, check out Solstice Canyon, Old Zoo Picnic Area, and Echo Mountain. To get to the trailhead: Take Sunset Boulevard to Will Rogers State Park Road, located 4.5 miles west of the 405 and three miles east of PCH. At the light, turn north on Will Rogers State Park Road. Drive 3/4 of a mile up the mountainside to the park entrance. Go through the gate and drive straight past the Will Rogers House to the end of the lot above the polo field. Park and walk to the east side of the field to find the trail. These photos were taken in August of 2010, July of 2011, and January of 2012. Click to enlarge. This 3.85-mile loop descending from Sullivan Ridge Fire Road into Rustic Canyon, east of Will Rogers State Park, where hikers can visit abandoned buildings once occupied by Nazi sympathizers. A prominent lone-standing Live Oak along Sullivan Ridge makes a natural turnaround point and a 7.5 to 8.3 mile round trip hike. 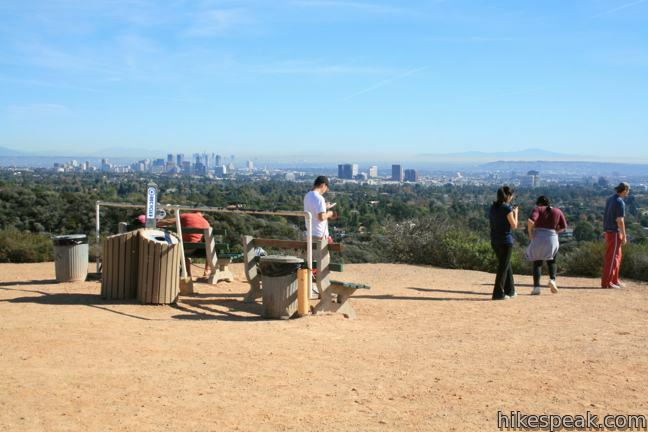 This easy 2.25-mile loop in Will Rogers State Historic Park leads to an overlook with views from Santa Monica Bay to downtown LA. 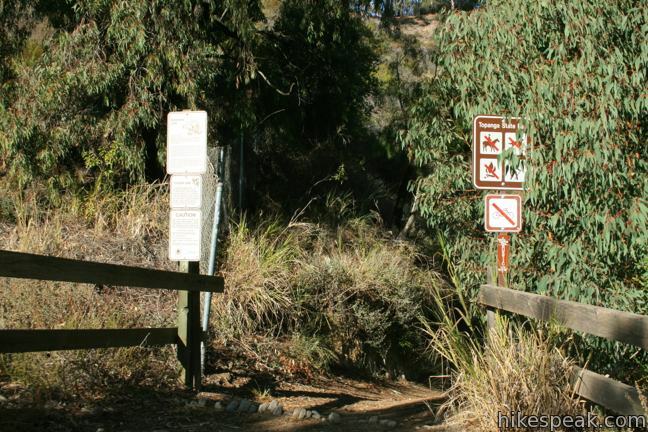 This 2.1-mile (one way) trail crosses a lush secluded canyon connecting Temescal Gateway Park to Will Rogers State Park. A brochure for Will Rogers State Historic Park including a map of the trails. Thanks for the history lesson! I never knew the history of those abandoned buildings until now. Cool, but very creepy. I’ve done a bit of trail running in CA, WA, ID, and UT, and this has been my favorite one, precisely because it’s so mysterious. I ran it quite a few times when I was in school in L.A. 10 years ago, but never had the chance to do it again until just a couple of days ago (drove up from Dana Point just for it). I’d recommend doing the loop in reverse to what’s described above–it’s true that the trail going down Rustic Canyon is harder to follow than going up, but as long as you stick close to the creek bed, you won’t stray too far. I inevitably get my feet wet, and I’d rather that happen at the end of the run than at the start. I took this “trail” just the other day with a friend… Unmaintained is an understatement. This path is NOT for the faint of heart. We followed the path in reverse of what they talk about here. 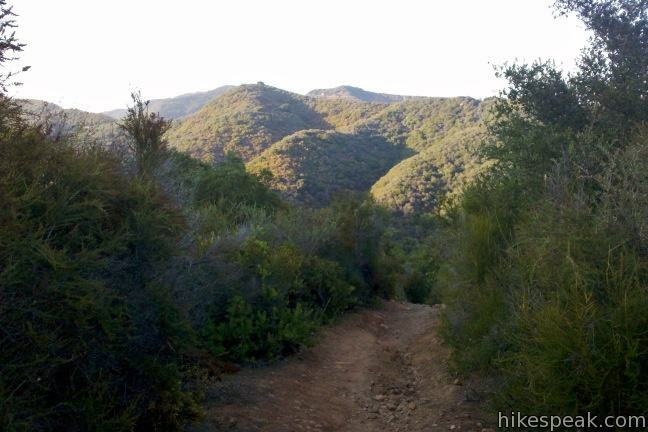 We started up the Backbone Trail, cut across then headed down the Rustic Creek Tail and back Will Rogers. The first two parts were ok. 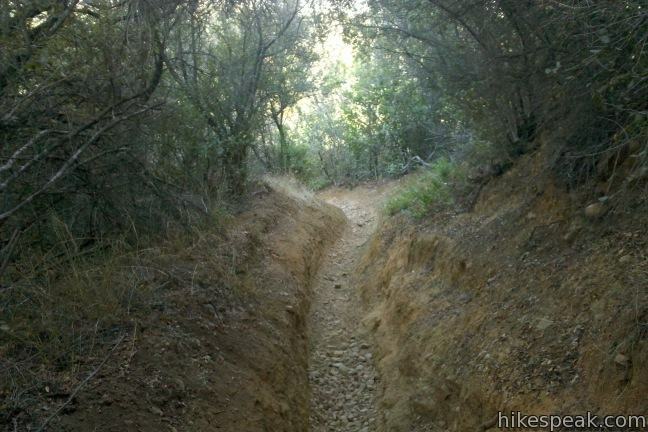 The Backbone Trail is well maintained, and easy to navigate. The cut across down into the canyon was not too bad to follow, however, portions of the trail were very steep. In one or two places loose gravel on the trail also make things rather slick, and you had to be careful not to lose your footing and slide down. From there things just got worse. The Rustic Trail is not very well marked, when it is marked at all. There are stretches where the trail just disappears completely, and you have to find your way along narrow stretches of the creek bank. Jumping from one side to the other countless times. There is a ton ducking and climbing. There are downed trees covering the trail at numerous points; some you can easily get over but not most. Being a bit tall myself (6’3″), I had to get down and crawl at a few points to navigate through some of the over growth. Many times we had to stop and look ahead to try to figure out the best path down the creek. Or even just to see if we could find the path again. A few times we had to back track when we took what we thought was the right path only to find it dead end, or start to head off in the wrong direction. I cannot even begin to guess how many times we crossed the creek, back and forth as we went along. It was all but impossible to stay dry as we progressed. Overall this is a very challenging hike and not one I would recommend to just anybody. On the map the loop is a little over 4 miles, it took us just over 3 and a half hours to complete. 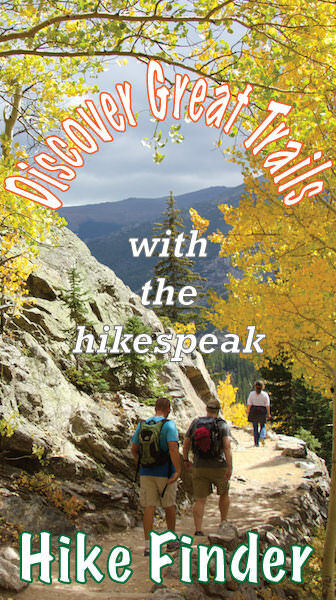 We just did this hike today and found this description of the trail, with some historical perspective. While somewhat challenging, the trail wasn’t that difficult, partially, because the water level was quite low. With a bunch of kids starting at 8 years old we took 3 hours to go around, taking plenty of stops along the way. I would recommend going in reverse direction to the description above, otherwise the description is spot on. 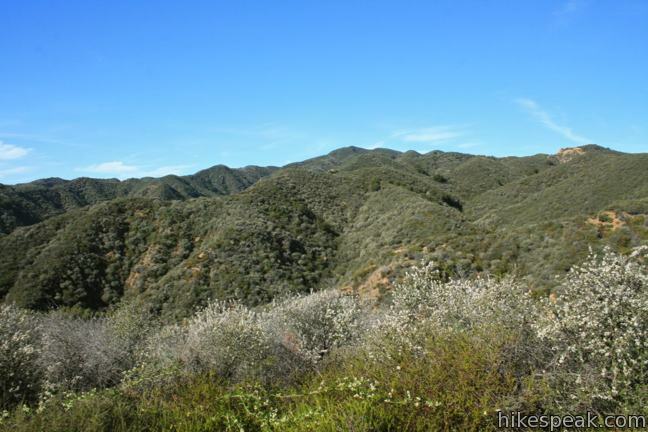 The hike is different from most in the Santa Monica mountains and I recommend it to all with even a bit of adventurism. My wife and I did this hike this last weekend and we would agree with Alec’s assessment. To call this a “unmaintained” trail is an understatement. We didn’t find it very pleasurable. We are experienced hikers and the canyon portion is not what I would call hiking. It is like a 2 mile obstacle course. Over logs, under branches, balancing on rocks to cross the stream, dodging poison oak and blazing your own trail at times. Once you get near the creek there is poison oak every couple feet. Usually I am not paranoid about deer ticks but after plowing through so much tall grasses and brush we checked every 1/2 mile. 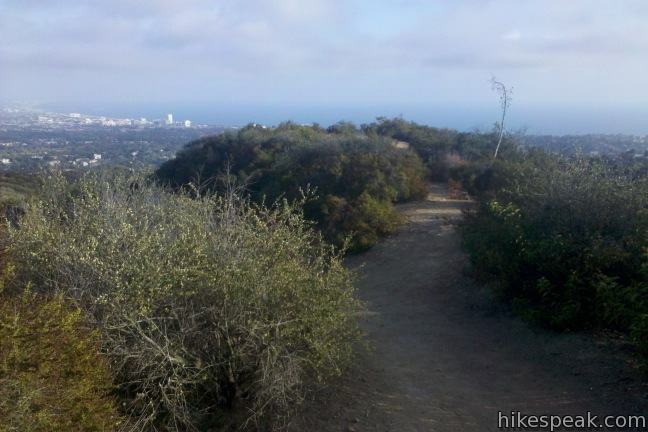 Backbone trail is nice, it is basic, nice views, well maintained. 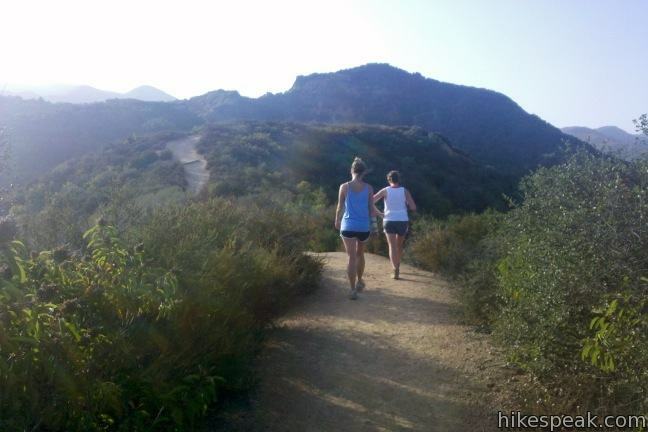 We started on the backbone and made the mistake of heading toward Rustic Canyon. The descent is pretty steep so I can see how going up it would be a workout. 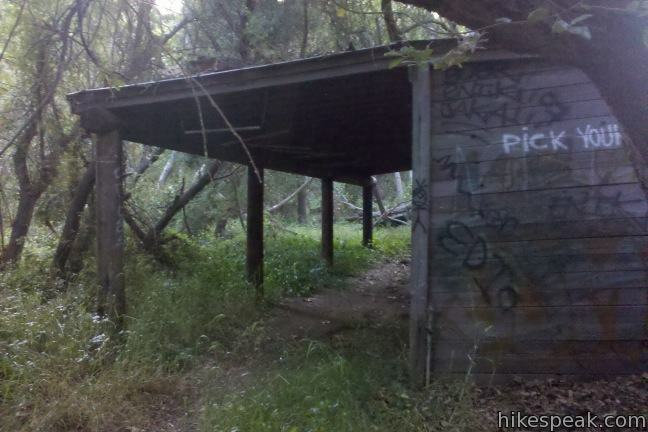 The highlight of Rustic Canyon is definitely the historic “spooky” buildings. My recommendation is to keep the kids on the regular maintained trail. 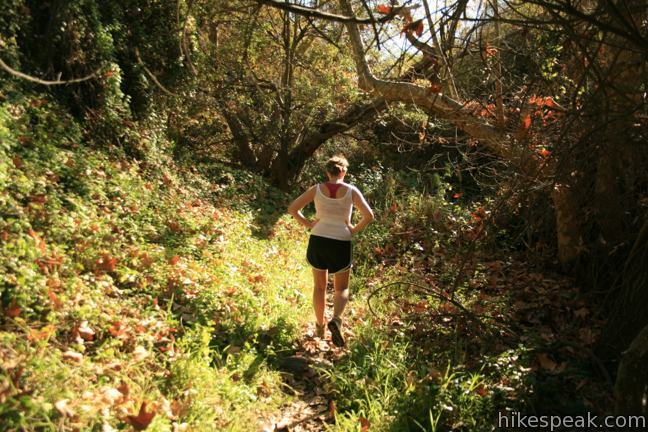 Avoid the possibility of getting poison oak or lyme’s disease and skip the 2 mile creek “hike”. We’ve done this hike in the reverse direction (up the backbone, down the creek) several times. A unique and interesting hike. Not that challenging to find a trail, just takes a little patience to look at alternatives when you hit an obstacle. The main issue for us, as Allen talked about, were ticks and poison oak. Lots of both. This is the only hike in the Santa Monicas where we found ticks crawling on us at the end of the hike. So if you go, wear long pants and and long sleeved shirts and tuck your pants into your socks. Also some tick spray on your clothes might be worthwhile! All that said, we really enjoy this hike, and have taken our more adventurous friends. BTW, we’re in our 60s, so the hike is definitely accessible (and easier in the reverse direction). 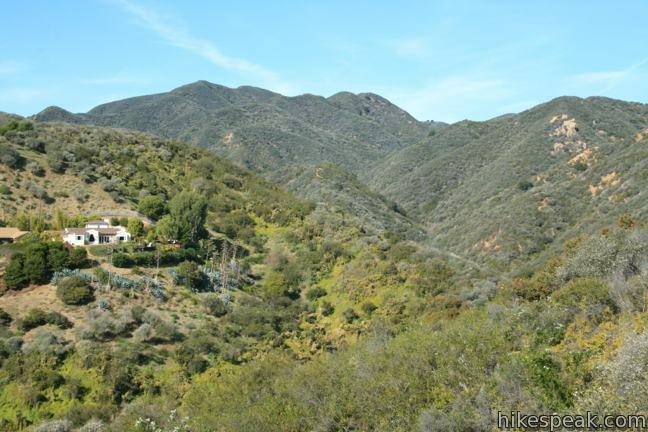 I lived very near Rustic Canyon and hiked it many times back in the mid 1950’s as a kid. Actually hiked once from Canyon Elementary School to the artists’ retreat called the Huntington Hartford Foundation. There was a boy scout camp called Camp Josepho further up the canyon. It was a very wild place – never saw anyone. Also, then it wasn’t a park and as far as I know it was not open to the public. We just walked mostly right up the stream that ran year round. Usually started at Sunset Blvd. I remember a dam up pretty far which had a rusted ladder and there was an old, abandoned, rusted out car (how did it get there? )at the base of the dam. The first time I climbed over I was disappointed that it was filled completely with dirt. Was hoping for a pond. Would love to hike the canyon again! I’d like to know your source for the claim that there was a Nazi compound in the canyon; there seems to be no evidence to support that claim. Rumors of Nazis may be responsible for the awful graffiti which ruined the appearance of the stone wall and gate off the Josepho road as well as the damage done to other structures in the canyon itself. Unsavory rumors attract vandals; sadly they have expanded their damage to the road itself, and graffiti is also sprayed on rocks along the main road. I wish your website would not spread such rumors; it encourages damage to the heavily-used public lands in the Santa Monica Mountains. People should be encouraged to take care of these properties, not to destroy them. 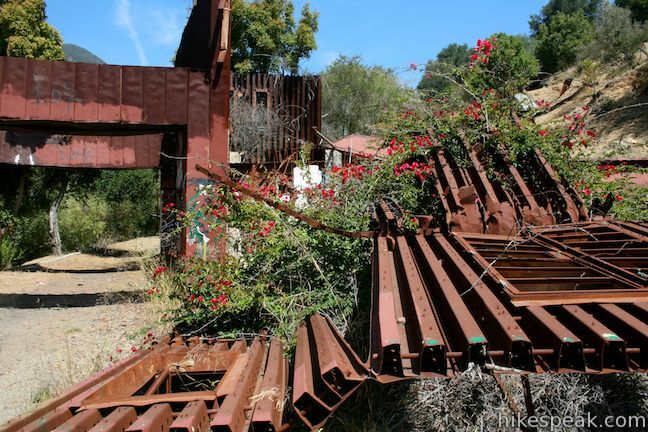 Rustic Canyon used to be a nice place to hike; now it’s an eyesore. The history of Murphy Ranch is drawn from the LA Times articles listed in the more info section above (article 1, article 2). I realize that and have read the articles. The problem is that the articles are based on the word of one or two people who weren’t around at the time–they are just rumors. Just a little bit of research indicates that they are untrue. There is no record of anyone by the name of Stephens living in the canyon in the 1940 census. One rumor says arrests took place in the canyon in 1941, another says 1945, and none list any reliable source of information. As I indicate, these rumors could be responsible for the vandalism in the canyon and turning what could be a beautiful hike into walking through a trash heap. To the extent that your website is spreading these rumors, it is responsible to some extent for the damage.